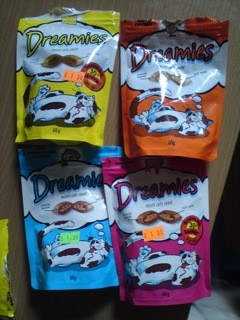 First thing to note about Dreamies is that they are a snack food, but one intended for cats. This may be a Food Stuff Finds first - food for other species - I'm really not sure, but in no way do I recommend humans eating these. We've had the original chicken flavour of these floating around in the house for a while, and I picked up the salmon one about six weeks ago. I thought these were pretty small time things but then I saw them advertised on TV - these are big time! The recent packs are slightly redone and there are maybe around 6 flavours now. I figured that this was enough of an incentive to get Duchess the review cat to do a comparison. Based on the packs alone there was notable excitement. I use these as an incentive to get her to go into the room where she sleeps. This is usually pretty successful as they are certainly her favourite treat. The packs suggest that you can give quite a few in one go, but I find usually 4 or 5 is plenty. Always make sure your cat has access to fresh water folks! To see which she fancied first I lined them all up (with 2 of each) and placed her in the centre. Naturally being a cat she wandered back to where the bags were originally and then to the end of the line and proceeded to eat them all. 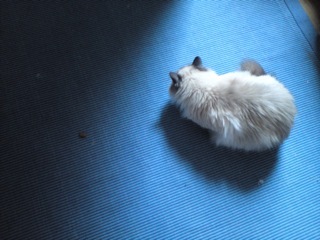 In short then - the flavour that Duchess the cat likes best is whichever is closest. To humans the coloured bags are the only real difference. If you want some reasonably priced cat bribes then you should consider these Food Stuff Finds approved, but just buy whichever bag is your favourite colour as if your cat likes one then they will probably like them all. 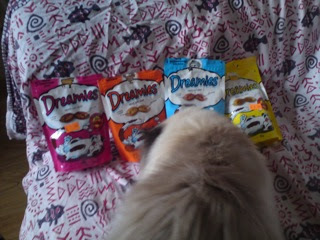 Personnally I prefer dog biscuits, tried the cat biscuits before and didn't really enjoy the taste. They are for cats though. My dog & cat love these, but over here in America they're known as: Temptations. I went through a period where I became besotted with trying out my dog's organic hard food. It was alright & I've stopped doing so since. Dreich / S.Emerals - you both tried them? :-D I'll stick with choccie biscuits for myself! They do look tempting, but I've seen the odd colours that they produce in the cat's hairballs. I think i'll let her have the rest. These are known as cat crack in my house.